I mentioned in a post a few days ago that we were getting ready for a special weekend, and this is why. Nick had been trying to get a reservation to The French Laundry since last year. He actually got one in December, but it was literally the day after we’d get back from our New York trip, and we just had too much on our plates (ha ha) to try to tack that on to the end of what we knew was going to be a very fun, but very exhausting trip. That, plus it would mean that we’d basically have to come home, re-pack, then drive up to Yountville where we’d have to have a reservation for a hotel during the Christmas season, and since you can’t get a reservation to The French Laundry except two months *exactly* in advance, we knew getting any lodging in the area at such short notice would be just way too expensive. This year, when our friend Wayne was visiting from Australia (when I drove down the crooked part of Lombard street, went to the House of Prime Rib, and hosted a Super Bowl Party for the first time), we talked about the French Laundry and how Nick had wanted to go last year, how hard it is to get reservations, and how exorbitantly luxurious (and expensive) it would be. As a (ridiculously generous) thank you for us having him stay with us during his visit, he left us $600 (in a sneaky note in one of our DVD cases, I might add), with specific instructions that it was for the French Laundry, and that he wanted to read all about it on IveNeverDoneThat.com. How awesome are our friends? We are so grateful for the amazingly wonderful people in our lives. So, Nick went on the hunt for reservations again. Every morning precisely at 10am, for weeks and weeks, he put in for a reservation on OpenTable.com for exactly two months out. It’s extremely difficult to get a table for two (which is what he lucked out on getting last year, the one we couldn’t take advantage of), so he looked for a reservation for four (it’s the best party size to get a chance at securing a reservation) … and he found one for the Saturday of Easter weekend (SCORE! Saturdays are EXTREMELY difficult to get), in the 5:30pm dinner seating (ULTRA MAGICAL SUPER SCORE – a Saturday dinner is the most coveted reservation and so of course, almost impossible to get. Many people just try for a weekday lunch, just to get in). Of course, Aaron was coming, and then of course we asked Laurie, who had also dreamed of going to the French Laundry for years. In my opinion, the 5:30pm seating was the absolute best time for our epic dining adventure to begin. 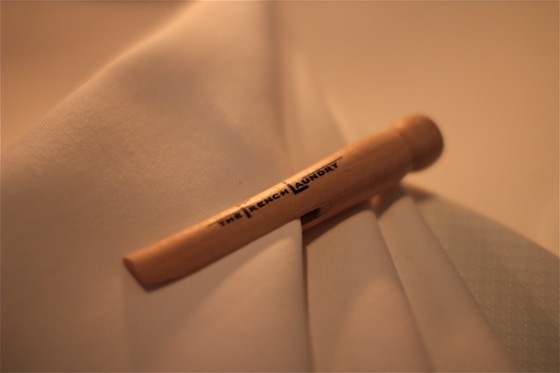 The French Laundry serves a tasting menu of at least nine courses, and the meal usually takes about four hours. Yes, you read that right. Nine courses. Four hours. There is a regular tasting menu, and a “vegetable” menu, which isn’t necessarily vegetarian, so much as it is more highlighting the fresh vegetables that are in season. Both menus cost the same, and the dishes on each menu are different every single day. 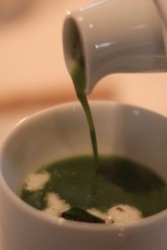 A lot of precise, careful, painstaking effort is put into each day, each menu, each dish at the French Laundry. We had read posts from people who had visited the French Laundry, and some of them mentioned the extended menu, which you need to ask for in advance, and the restaurant will let you know if it’s possible for your party. This extended menu has around 16 courses, and unlike the regular menu (which is shown to regular menu dining guests when they’re seated), you don’t find out what you’re eating until each course is brought out to you (with the extended menu, they like to surprise you). The posts that mentioned the extended menu all said that they’d suggest NOT choosing it, as they were so full when having just the regular menu, that they couldn’t imagine the extended menu being doable. We opted for the extended menu. We decided, go big or go home, right? This may be the one and only time we come to this place, so why not experience it all? Warning: Many pictures to follow. 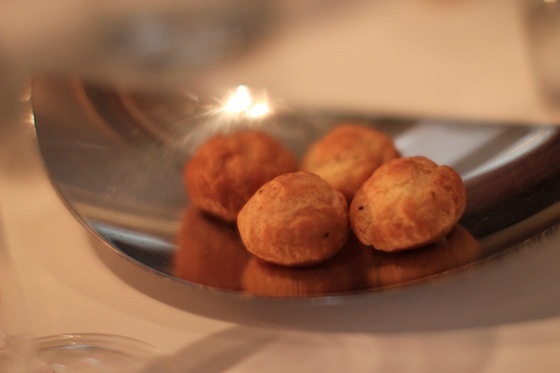 We were greeted with these adorable “Gruyere Filled Mini-Brioches” – and they were absolutely wonderful. Lightly crispy on the outside, creamy, rich, buttery Gruyere inside. I wished there were more, but I knew we were just getting started. 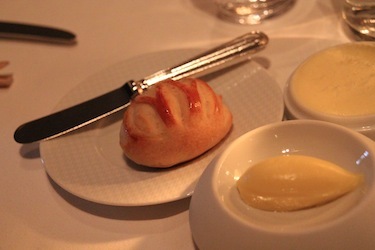 Then came the signature “‘Cornets’ – Salmon Tartare with Red Onion Crème Fraîche” in a little sesame crisp cone. Since its introduction to the menu, people have loved it and requested it so much, it was added to the menu as a treat that everyone gets. 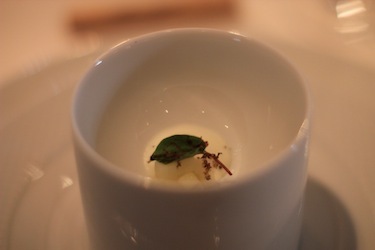 The soup course was “Velouté Of Sorrel – Yukon Potato and Black Winter Truffle” – the potato and truffle, and a bit of cream are at the bottom of the cup, and the sorrel velouté is poured over the top. Very green, very fresh, very springtime. 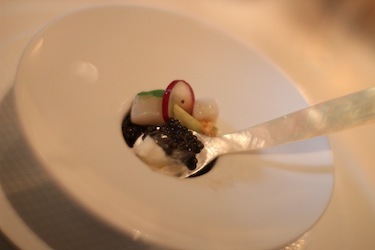 The caviar course is usually the also signature “Oysters and Pearls” dish, but since we had the extended menu, we got something that was a bit special, and also very “springy” and fresh. 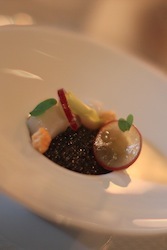 “Royal Ossetra Caviar – Scallop ‘Tartare’, Cauliflower, Red Grapes, and Verjus Gelee” – the fresh, clean qualities of the grapes, the scallops, and the gelee went so well with the saltiness of the caviar, and all the textures together made for wonderful little bursts of flavor. 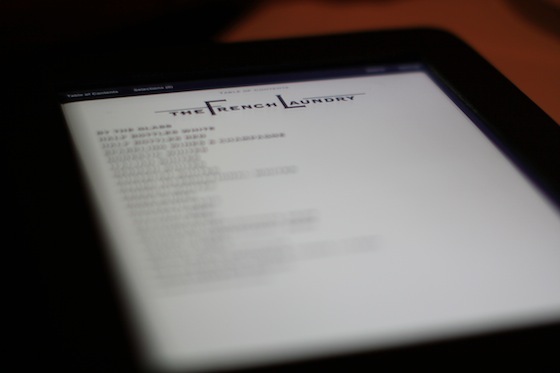 Their extensive wine list is on an iPad – Nick loved that. We ordered a bottle of their “Cuvée French Laundry,” specially made for them by Schramsberg Vineyards, and told our sommelier that since we weren’t sure what our dishes would be, we’d need a bit of help choosing other wines, and that our price point was … “modest”. He chose another white and another red for us, and custom blended special juice beverages – a whole carafe of each, to match our three wines – just for Nick! How awesome is that? 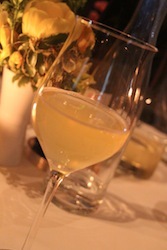 When each new juice concoction was presented, we were all excited to try Nick’s special drink – even more than the wine! 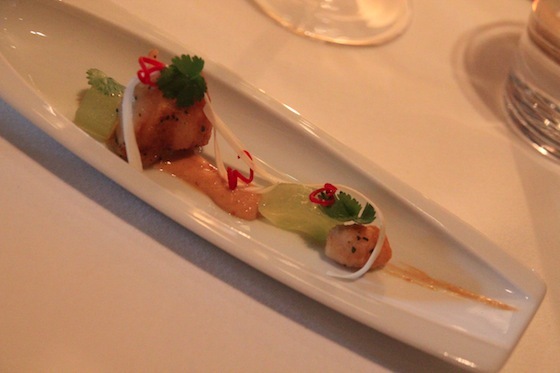 Next was the “‘Cuisses De Grenouille’ – Hearts of Palm, Cucumber, and ‘Satay Sauce'” Frog legs! Yum. They did not “taste like chicken”. 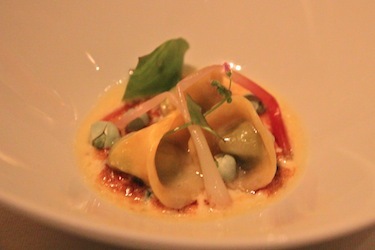 This presentation was tender, delicate, and the flavors really jumped off the plate. Yes, I had to do that. 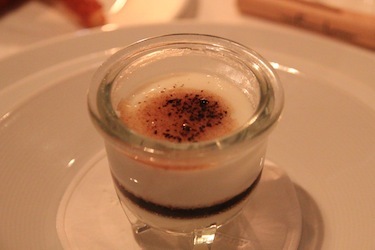 “Crème Fraiche Custard – Brioche Soldiers and ‘Sauce Bordelaise'” – this was Chef Keller’s play on “Eggs and Toast” – a crème fraiche custard with a coddled egg, brioche toast sticks, and an extra bit of bordelaise on top – velvety, rich and delicious. 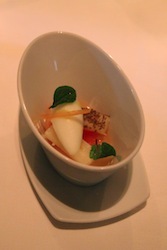 “Salad Of Holland White Asparagus – Grapefruit, Buckwheat ‘Annelini’ and Yogurt Sherbet” – this was lovely – refreshing, light, lots of fun textures. 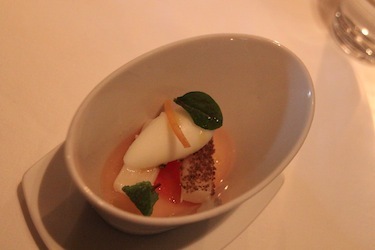 The yogurt sherbet was tart and fresh, and the buckwheat “annelini” reminded me of Grape-Nuts. I loved this one. Bottom left: A shot of one of Nick’s special juice concoctions. Our sommelier let us know that he was specifically mixing these juices for Nick to match the elements of the wines that we were having – so every beverage would compliment the dishes. So awesome! Bottom right: A roll from Bouchon Bakery, plus an unsalted butter from a dairy farm in Sonoma, and the salted butter (top right) is from another special purveyor in Vermont. So indulgently wonderful. 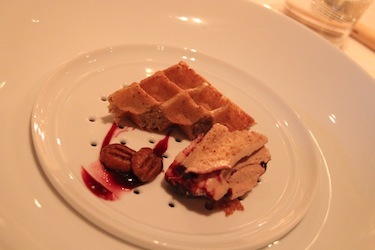 This dish was the crowning glory of the meal; “‘Blueberry Swirl’ – Foie Gras, Pecan Waffle, Pickled Blueberries, Cinnamon, and Bourbon Maple Syrup”. 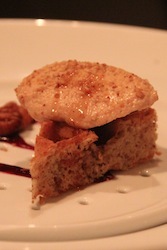 The foie gras was transformed into a rich, yet light, smoky, spectacularly delicious mousse, and the pecans and blueberry complimented it wonderfully. With the waffle it was great – with our rolls it was great, on its own it was great. This was fantastic. The dish its served on is perforated because below, there were heated aromatic spices that added to the overall flavor sensation. We later learned (from our head waiter, Andrew, and from Chef de Cuisine Timothy Hollingsworth himself) that this was the very first time they had ever done this presentation. Absolutely fantastic. 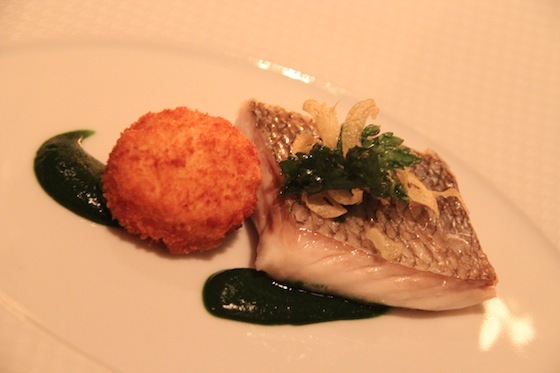 “Sautéed Fillet Of Atlantic Sea Bream – Garlic Palette, Garlic Chips, and Parsley Coulis” – lovely. Light, yet meaty fish, crispy garlic palette and chips, the parsley coulis and the fried parsley on top … it was all just lovely. 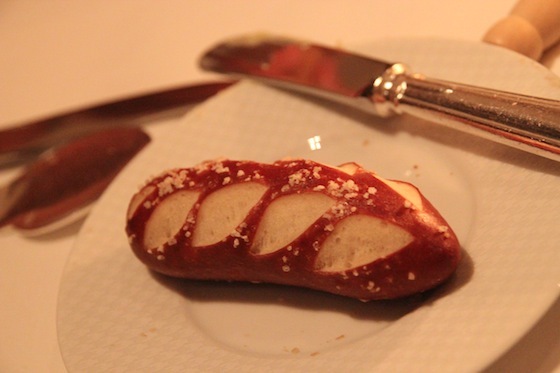 Another bread offering from Bouchon Bakery – their baby pretzel roll. Adorable and yummy. 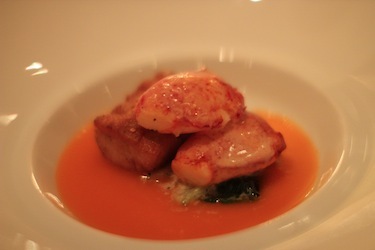 “Sweet Butter-Poached Maine Lobster ‘Mitts’ – Ris de Veau, Romaine Lettuce, Truffles and Chilled Nantes Carrot Velouté” – Lobster claws, poached perfectly in butter, veal sweetbreads, and the carrot velouté is poured around the whole masterpiece. A triumph. 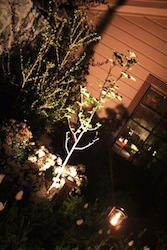 After all this wonderful food, we took a little break and enjoyed the night air, and the courtyard. 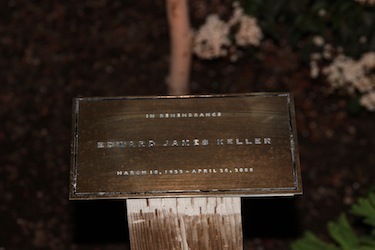 A tree in the corner was planted in Thomas Keller’s late father’s memory. Chef Keller didn’t know his dad for much of his life, but they reunited and became very close in later years. A very touching article about their relationship and its impact on Chef Keller was written in the New York Times after Mr. Keller’s passing. 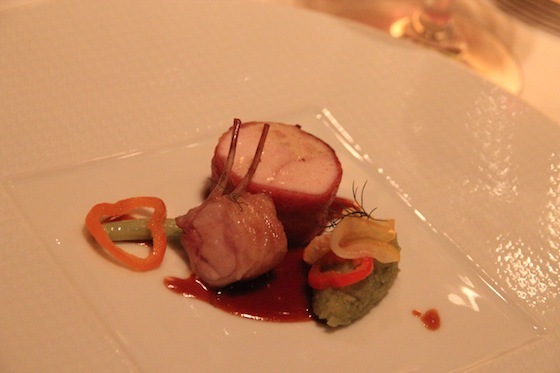 When we returned to the table, we were next served “Devil’s Gulch Ranch Rabbit Sirloin – Hobbs’ Bacon, Young Fennel, Meyer Lemon and Piquillo Peppers” – bacon-wrapped rabbit sirloin? Yes, please. Gorgeous, and absolutely delectable. 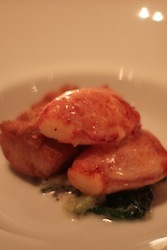 The next course was another one of my favorites. 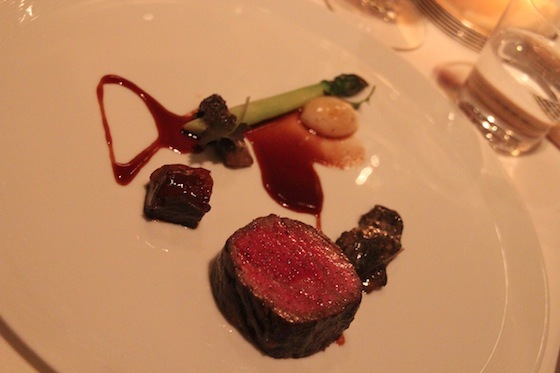 “49 Day Dry-Aged Snake River Farms Beef – Smoked Quail Egg, Green Asparagus, Morels and Sauce Bordelaise” … spectacular … just spectacular. After this, I excused myself to visit the ladies’ room (there was a lot of wine and water all night!) and Aaron decided to check out what the courtyard facilities looked like (there are three different restrooms, and Laurie and I told the boys the courtyard one was the best, particularly because you get to enjoy the garden and the cool evening air on the way). On our way back, we peeked into the windows of the kitchen. As I was admiring the rest of the courtyard garden, Aaron exclaimed, “He’s here!” I looked in, and saw Chef Thomas Keller himself, just entering the kitchen. We freaked out like little schoolgirls. Neither one of us had our cameras of course, since we were just at the restroom! We needed to get back inside, quick! We needed to visit the kitchen! We walked back in, trying to contain our excitement, and told Nick and Laurie what we had just seen. We were actually so excited that Aaron told me I should tell them, but I wanted him to be able so tell them too, so we divvied up the duties. Hilarious! After we sat down and shared the exciting news, we asked for a visit to the kitchen, and Andrew let us know that he’d take us there right after our cheese course: “‘Abbaye de Tamié’ – Black Winter Truffle, Prune, Pine Nut and Mache” – we all ate as quickly as we could while still trying to maintain our composure. The cheese was lovely, the accompaniments were delightful. But all I could think about was getting into that kitchen. Andrew brought us into the kitchen, and we stood in the little spot designated for guests, so we wouldn’t get in the way of the swift, precise operation going on around us. 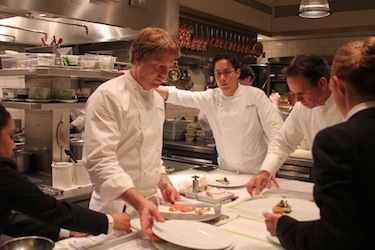 We watched, starstruck as Chef de Cuisine Timothy Hollingsworth, and Chef Thomas Keller himself, inspected and finished dishes on their way out. Andrew let us know that Chef Keller might say hello to us, which was exciting, but we just didn’t want to get in anyone’s way. Chef Hollingsworth did take a moment to say hello, and shook our hands! We were able to tell him that everything was wonderful, and he thanked us. 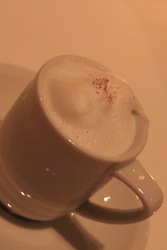 We stood in the kitchen for a few more minutes, and then, not wanting to linger too long, headed out. As we were leaving, Chef Keller got a chance to greet us, and shook Laurie’s hand! 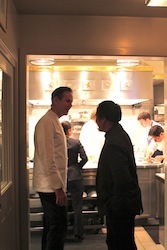 Then mine, and Nick and Aaron came back to shake Chef Keller’s hand as well. Aaron even got a chance to tell him that he works at Pixar, and that he really admired the work that Chef Keller had helped them with on Ratatouille. Chef Keller was very gracious, and told Aaron to tell everyone at Pixar he said hello, and that he really enjoyed working with them. We even snapped a picture of him smiling! Just so awesome. After an experience as amazing as that, who could eat? 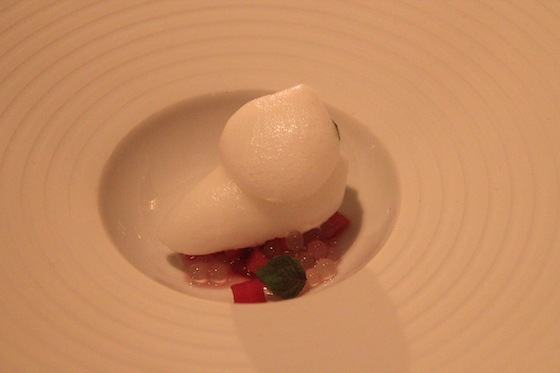 Luckily for us, we had reached our palette cleanser: “Persian Lime Sorbet – Field Rhubarb and Ginger ‘Nuage'” – here was a great example of molecular gastronomy – the “ginger nuage” is the “cloud” of ginger-scented foam on top, and the pearls at the bottom are created using Sodium Alginate and Calcium Chloride (along with whatever you’d like to use to create the pearl’s liquid center). Beautiful, bright flavors, not too sweet – a truly fitting, cleansing, refreshing course to enjoy after all of that excitement. 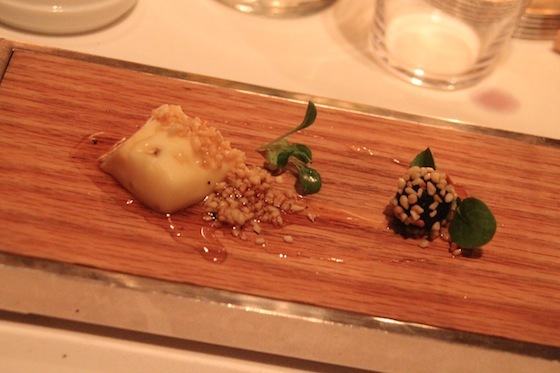 Next came a dessert course: “Praline ‘Cremeux’ – Gros Michel banana and ‘Dacquoise'” – a beautiful “Praline cream” atop a bit of hazelnut cake, dainty banana cubes, and a crumble topping – finished with a gold-streaked chocolate wafer. Absolutely gorgeous, and it tasted even better than it looked. 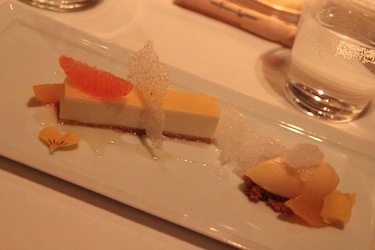 Next came the “Cream Cheese ‘Bavorois’ – Navel Orange, Cardamom and Acacia Honey ‘Granite'” – a delightful citrus cheesecake cream, sorbet, and honey candy. Yum! 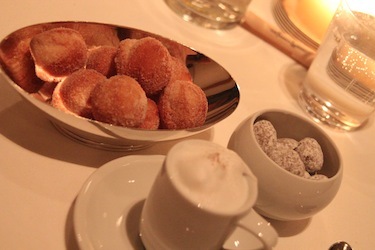 Then came another signature offering: “‘Coffee And Doughnuts’ – Cappuccino Semifreddo, Brioche Doughnuts, and Roasted Macadamia Nuts” – the perfect way to end the meal. The macadamia nuts were toffee-coated, then chocolate-covered, and dusted with powdered sugar. Like Mele Macs (Nick’s favorite), but a bit more delicately refined – and since the macadamia nuts were also roasted, the flavor had a more complex richness to it. The doughnut holes were light and yet substantial at the same time, and the cappuccino semifreddo was like the most wonderful coffee ice cream/shake/mousse you can imagine. Nick had actually made this dessert as a surprise or us when we got back from Mexico this past weekend, from the French Laundry Cookbook, and he nailed the semifreddo, hands down. This was fabulous. 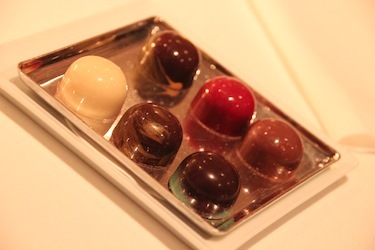 Finally, we were presented with some gorgeous chocolate truffles. 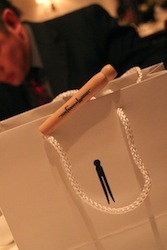 We had them boxed and added to our lovely goodie bags that they sent us home with. Inside were tins of shortbread cookies from Bouchon Bakery. We had an absolutely phenomenal time. Before coming, I wasn’t sure how I’d feel about the food and experience, compared to the cost. After our visit, I would (and will) most definitely go back. While it is, of course, an expensive meal (Wayne’s contribution paid for half of our dinner when all was said and done – THANK YOU, WAYNE! ), we calculated the cost per course, and considering the outstanding quality of the ingredients, the price is not exorbitant when compared to that extraordinary quality. 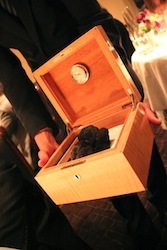 And that’s not even factoring in the excellent, detail-oriented, personalized experience of service that you receive when dining at the French Laundry. As I mentioned earlier, our sommelier (himself!) created special non-alcoholic beverages just for Nick, and he also did a fantastic job keeping our wine costs down; even with our original order of their special bubbly (at $140/bottle! ), our total wine bill tab for the table was “only” $304 (yes, I know that’s still a lot of money, but none of the wines offered are anything less than fabulous), and the wine was perfect. At the French Laundry, you are taken care of, graciously attended to, and during our 7-hour dinner (that’s right, we were there for seven hours), we were never, ever rushed. 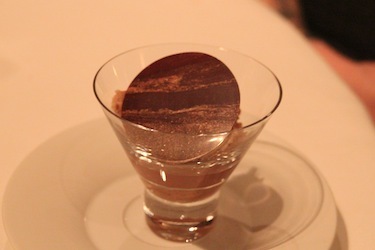 If you were considering going to the French Laundry, go. Save up some funds just for the occasion, get your typing/dialing fingers ready (they accept reservations over the phone as well, but calling will often result in busy signals), and get to Yountville. Make a weekend (or a week!) out of it! 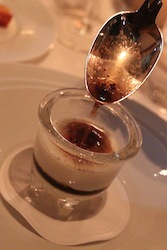 Chef Keller, Chef Hollingsworth, and their team will not disappoint.